As a multi instrumentalist, in-demand producer and re-mixer, a DJ with his finger on the cutting edge of contemporary sounds, and an ear tastefully cocked to the hippest soul, jazz and funk music from the 60’s and 70’s, Adam Gibbons, the young man at the centre of the Lack Of Afro phenomenon, has already established an unrivalled reputation as one of the most crucial names at work in funk and dance music today. The LOA story began back in 2006 after excited word spread to the Freestyle Records offices about the sounds Adam was creating, Freestyles’ head honcho DJ Adrian Gibson instantly signed him and released the stunning debut single “Wait A Minute”. One of the labels fastest selling 12”s ever, it has gone onto sell massive numbers worldwide and appeared on countless compilations. The subsequent 2007 album “Press On” fulfilled his early promise, with Adam playing nearly all the instruments himself. Hailed by iDJ magazine as “one of the greatest albums of the modern funk era” the release passed into contemporary music folklore. 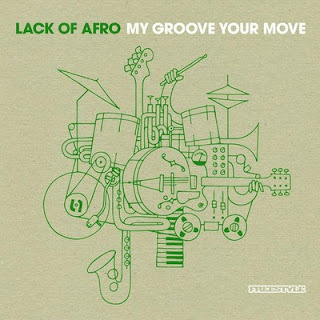 Whilst retaining the signature Lack Of Afro elements of deep dish drums, Nick Radfords rootsy guitar picking, ex Ocean Colour Scenes’ Damon Minchellas’ thundering bass, spliced with intelligent use of rare samples “My Groove, Your Move” is without doubt an even more confident, assured and mature collection than its predecessor. This album is a high octane, trail blazing and innovative venture that is comfortable with it’s own past, our present and everyone’s’ future. Here is an example of a cheep and cheerful, yet effective promo blog. Fill in the reaction sheet. Once you have submitted your reaction, click here to see the underlining spreadsheet for this example.